Join the Cleveland Chapter of the Carpatho-Rusyn Society as we celebrate the 100th Anniversary of the Cleveland Cultural Gardens. We will have an information table. Living Traditions Folk Ensemble will perform at our garden and on the main stage. We encourage any C-RS members to march in the Parade of Flags. If you happen to be in town, please take part in this historic event. The Cleveland Cultural Gardens was begun with a donation of 254 acres of land, in the heart of the city, by John D, Rockefeller for Cleveland's centennial in 1896. The Shakespeare Garden (later to become the British Garden) was first in 1916. In 1926 the concept of gardens to represent the wide range of ethnic communities now in the Cleveland area was begun with the Hebrew Garden. Through a joint effort of the ethnic communities, City of Cleveland and the Federal Government - with a lot of work done by the WPA - the gardens came to be, one at a time. There are currently 31 gardens including our Rusin Garden which came to be through the efforts of Father Joseph Hanulya and the Rusin Eite Society in 1939. Our garden is on two levels reminiscent of the hills in the Carpathian Mountains. 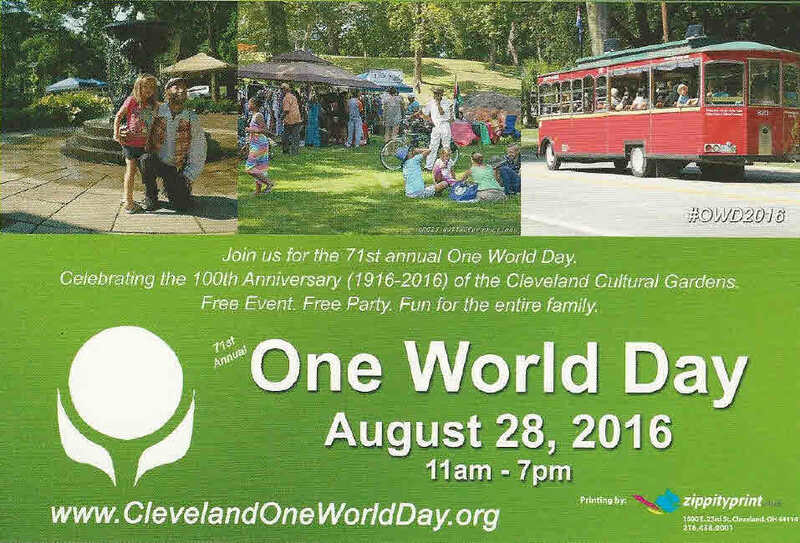 2016 is the 100th anniversary of the gardens and the 71st annual One World Day celebration. This includes the Parade of Flags - tours of the gardens - Naturalization ceremony - Cultural performances - Authentic ethnic foods and family activities for all ages.